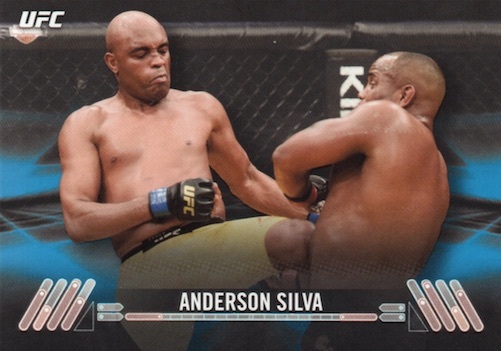 Maintaining the format established the previous year, 2017 Topps UFC Knockout sticks to a more premium path with a pair of hits in every pack. Exclusive to a hobby format, each box yields a total of four autographs and four relics. The packs break that down further with one autograph, one relic, and two base parallels per mini-box. The base set is again relatively plain in design with 100 subjects from the octagon. Base parallels come in every pack and include Green (#/215), Blue (#/99), Red (#/25) and Gold (1/1). But that's not all for 2017 Topps UFC Knockout. The base Knockout Autograph insert also offers some hard-signed autographs for subjects in the checklist. These are joined by Green (#/50 or less), Blue (#/25), Red (#/10) and Gold (1/1) parallels. 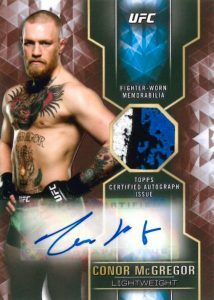 A new option that focuses on the biggest and baddest names, the Fearless Fighter Autograph line features on-card signatures in blue ink for the base and Copper Ink (#/10) and Gold Ink (1/1) parallels. 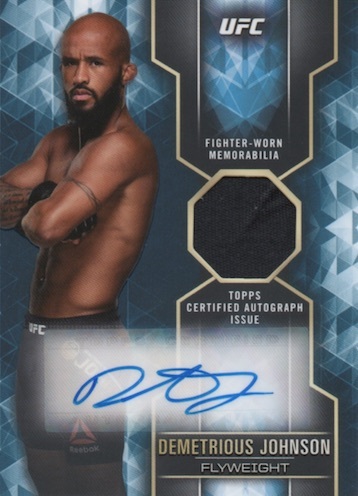 As far as auto relics, 2017 Topps UFC Knockout has plenty of choices, as well. Among these are Knockout Autographed Relic inserts in base, Green (#'d), Blue (#/25), Red (#/10) and Gold (1/1) editions. 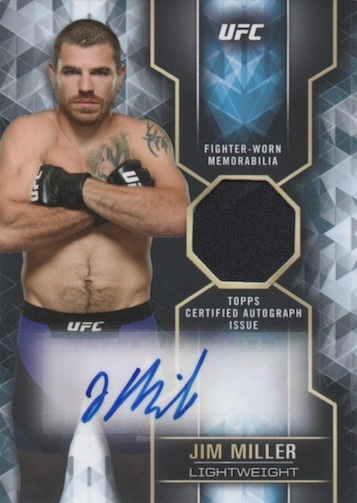 New Fight Glove Autograph Relic and Autographed Tier One Dual Relic cards are also in play along with UFC Champion Autograph Relic Book and Dual Autographed Tier One Relic Book. 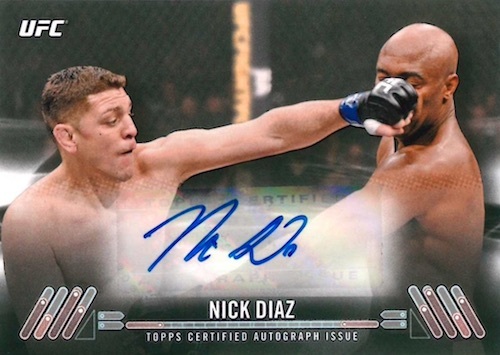 Like the autographs, memorabilia cards drop in each pack of 2017 Topps UFC Knockout. 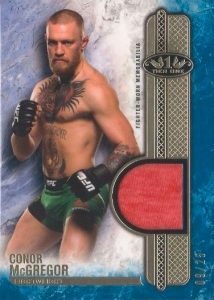 They include Knockout Relics, Fight Mat Relics and Tier One Relics with corresponding Green (#/50), Blue (#/25), Red (#/10) and Gold (1/1) parallels. PARALLEL CARDS: Green #/215, Blue #/99, Red #/25, Gold 1/1. PARALLEL CARDS: Green #/35, Blue #/25, Red #/10, Gold 1/1. 31 cards. Serial numbered #/149 or less. Shop on eBay. PARALLEL CARDS: Green #/50, Blue #/25, Red #/10, Gold 1/1. 24 cards. Serial numbered #/35 or less. Shop on eBay. PARALLEL CARDS: Copper Ink #/10, Gold Ink 1/1. 24 cards. Serial numbered #/130 or less. Shop on eBay. PARALLEL CARDS: Green #/50, Blue Jumbo #/25, Red Jumbo #/10, Gold Jumbo 1/1. 30 cards. Serial numbered #/99 or less. Shop on eBay. 27 cards. Serial numbered #/125 or less. Shop on eBay. 28 cards. Serial numbered #/200 or less. Shop on eBay. PARALLEL CARDS: Copper Ink #/15, Silver Ink #/10, Gold Ink 1/1. 21 cards. Serial numbered #/149 or less. Shop on eBay. PARALLEL CARDS: Red #/25, Gold 1/1. 12 cards. Serial numbered #/10. Shop on eBay. 14 cards. Serial numbered #/5. Shop on eBay. Good: Some on-card autographs, two hits per pack and eight hits per box, Tier One. Bad: Box price is steep, still way too many sticker autographs, muted main design doesn’t scream high-end. 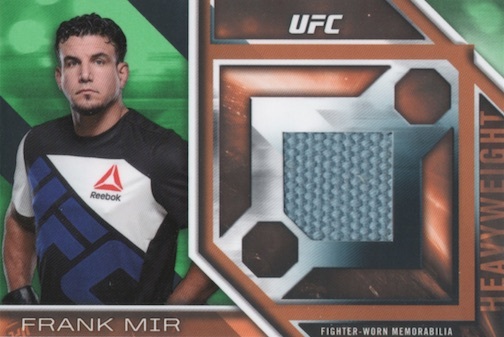 The Bottom Line: With a tighter checklist, more hard-signed options and Tier One inserts, 2017 Topps UFC Knockout pushes back in the right direction for MMA collectors. The big variable is the box price, which remains on the high side. 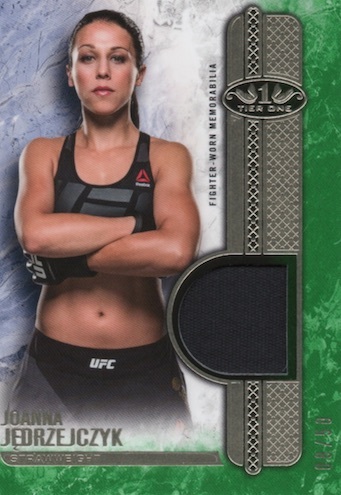 While the base stock is thin, the card design is solid and the fighters really stand out with a glossy finish. For me, the issue is the dark gray that occupies much of the background. That becomes really apparent once you see the parallels that add in wisps of color. All numbered, these are still common enough to pull several across the box, which I liked. Given the simplicity of the base cards, it might be easy to expect one-note hits but Knockout saves all the design variety for the autographs and relics, and the Tier One inserts really help. Even the ornate, foil-filled Tier One Relics made a good impression despite the small, one-color swatch. For me, the real winner here is the on-card Fearless Fighters insert with a gold ink signature using a thick pen. The main Tier One Autographs also have an impressive look with the marble-like background and hard-signed autograph. I wasn’t as impressed with the Fight Mat Relics and Knockout Relics, which both dedicated a lot of the card space to highlight the very small relic. The jumbo mats do look better. 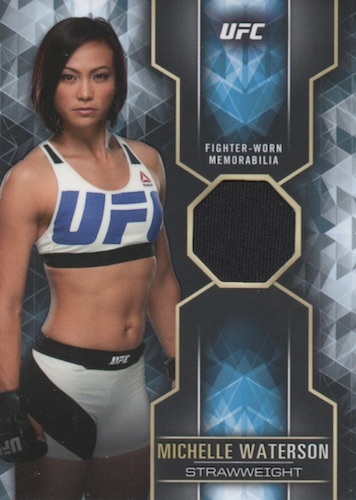 Plus, it is always nice to have something specific to point to when it comes to a relic, and the mat card notes the UFC event in question as opposed to the generic disclaimers on the other relics. 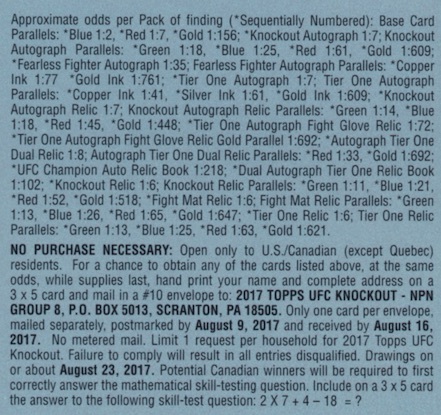 Although the set is fundamentally the same, the 2017 Topps UFC Knockout checklist is tighter than 2016. It still feels like we see a lot of the same signers, year after year, but there is top-level talent to be found. And you are unlikely to hear complaints about McGregor, Rousey, or Liddell. Plus, there is a decent selection of young talent on the female side. 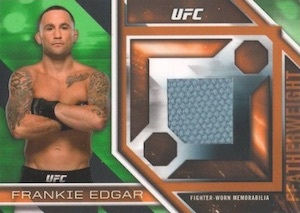 Given the eight hits per box, there is pretty good value in 2017 Topps UFC Knockout. The problem is that box prices sit at around $140-160 at the time of this review, and half those hits can be $1-2 relics. That pushes this more into the danger zone with talking about the risk. One thing that helps is that the format is safer to purchase by the pack since each is like a sealed mini-box with one autograph and one relic. I would have liked more flash with the main design but this is a fun product. The flood of hits in my box even included two on-card autographs. 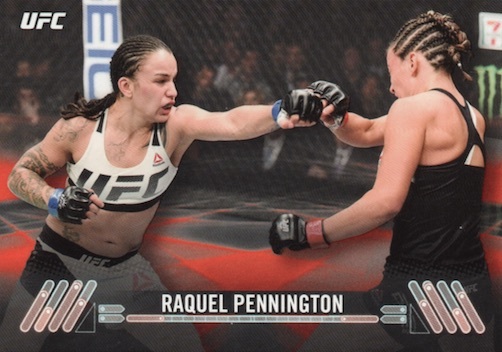 Both being for the same fighter (Miesha Tate) was not ideal, but they were from completely different inserts, which made it better. I guess the main problem for me is that the product relies mostly on inserts that are from a different brand. Making the premium UFC set a testing ground for spinoffs is not the way I would go about building a brand. Also, what does that say about the product when nearly all excitement is for cards that aren’t even really related to the set? Despite this, Knockout does a better job this year and, as a result, it was more fun for me. Nice checklist. Re sell value early on ebay hard to tell, not seeing much selling for a $140 box. 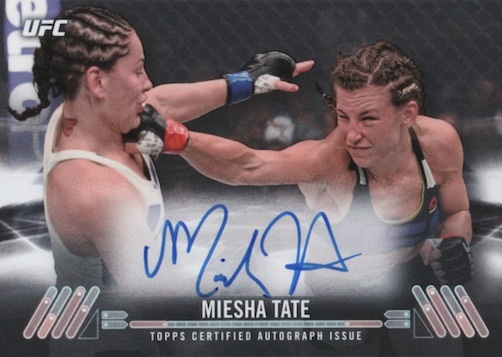 I got a Tate Fearless fighter gold pen on card auto 22/25 – not sure what it’s worth. 1 auto, 1 relic per pack. 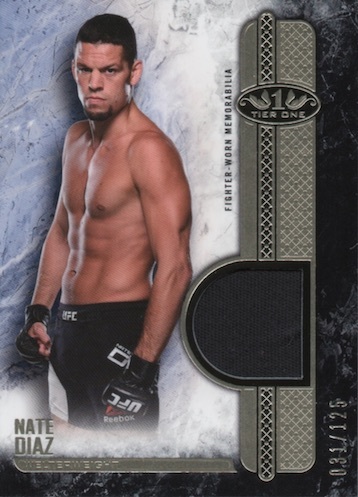 would really appreciate if you could build a separate page with list of UFC fighters and their First auto card…. 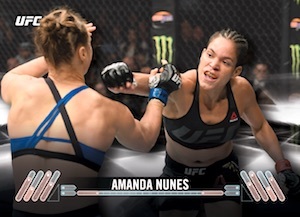 been trying to find auto which cards are the first ones for a few fighters and I am sure many people would want such a reference and your site should have it..